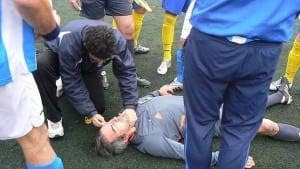 A NERJA goalkeeper who hospitalised a referee in a violent attack during a football match is to stand trial in Malaga. Ivan Cabello faces a 26-month prison sentence after assaulting referee Juan Sanchez during a game with Granada team Huetor Tajar in May 2012. Cabello punched Sanchez in the face before kicking him twice on the ground, knocking the referee unconscious. His Nerja teammates had to pull the goalkeeper away as he wrapped his hands around the ref’s throat. Cabello snapped after being shown a red card for intentionally kicking the ball at the referee. Cabello admits that the incident ‘shouldn’t have happened’, but claims the referee antagonised him. “I’m not going to say what he said to me until court,” he added. Sanchez was taken to Velez-Malaga hospital where he was treated for an injury to his left eye. The player is serving a four-year playing ban handed out by the Spanish FA and now faces a criminal conviction. As well as asking for a prison sentence, the prosecutor is demanding compensation to be paid to the referee.